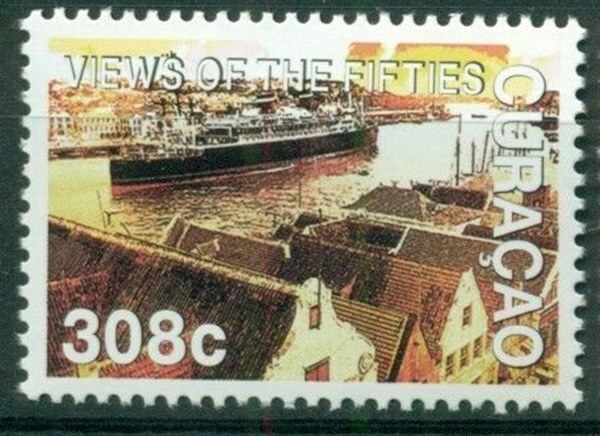 By this set of stamps issued by Curaçao in 2017, two stamp shows a ship. 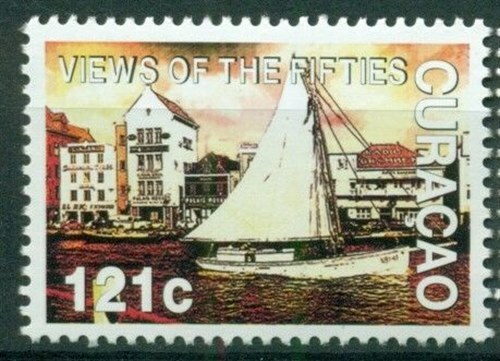 Views of the fifties is a stamp emission to remember life on the island in the fifties. Most of the photos used dated back in the end of the forties, beginning and mid fifties. Various of the photos were taken by Master Photographer Fred Fisher. These photos were digitally converted and carefully retouched and resampled to create and retain a vintage uniformed look, by creating a balanced workflow, retaining the same structure and a color adaptive process. 121c: Handelskade (Commercial quay) and the entrance of the harbour. The Port Authorities building in the back has been completely replaced by a more modern architecture. 24 March 1932 launched as the SANTA ROSA, three sisters, SANTA ELENA, SANTA LUCIA and SANTA PAULA. Powered by two General Electric Co. steam turbines, each 6,000 hp., double geared to twin screws. Speed 19 knots. Passenger accommodation when built 209 first class and 50 tourist class. October 1932 completed. Homeport New York. 1938 She was sold or transferred to the Grace Line Inc., San Francisco not renamed. 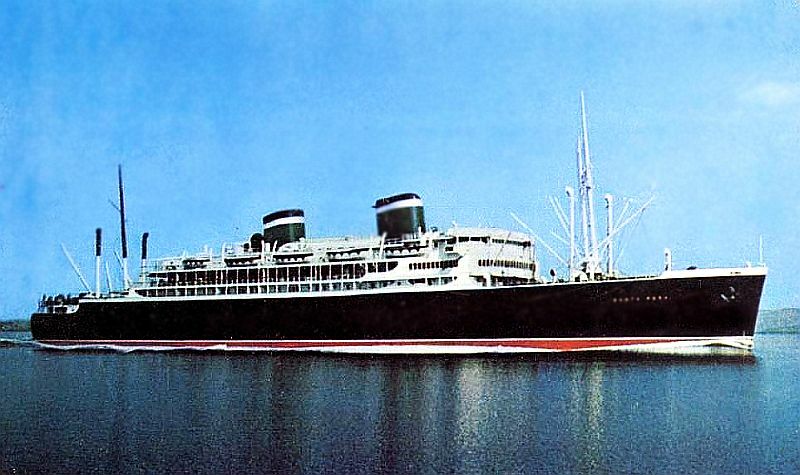 Designed by Gibbs & Cox, SANTA ROSA bore some resemblance to their later ships, the SS America and SS United States. such as his signature winged funnel. The public rooms were all on the promenade deck. The dining room was located on this deck between the two funnels and had an atrium stretching up two and a half decks. Unique for its day was a retractable roof which allowed the passenger to dine under the tropical sky. The Grace Line also employed female waitresses instead of male stewards. All first class cabins were outside twin beds and private baths. The SANTA ROSA sailed on her maiden voyage on 26 November 1932. Her East-West coast route of New York-Seattle was 20 days and included a one-day call in Los Angeles and two days in San Francisco. The ship's service speed of 20 knots and her superior accommodation made her very popular compared to that offered by Pacific Coast shipping. In 1936 however the intercoastal service ended and SANTA ROSA and her sisters transferred to service to the Caribbean. "..Further down and across the dock, the Grace Line passenger ship SS SANTA ROSA, also lay waiting. She was painted wartime gray but she still flaunted her nubile twin funnels, sweeping bow and long, beautiful lines; She exuded an aura of speed, luxury, and moonlight tropical nights. The SS SANTA ROSA was sexier than Rita Hayworth in a travel poster..."
SANTA ROSA made 21 voyages from the east coast of the US from 1942-1945: one to Europe, one to Australia, one to India, and three to Africa. The vessel was returned to Grace Line on 3 February 1947. After her war service she underwent repair and refit at the Newport News Shipbuilding & Drydock Company prior to redelivery to her owners. SANTA ROSA returned to Grace Line and resumed the Caribbean service on 7 February 1947. In 1958, after 26 years of service, SANTA ROSA was replaced by a larger liner of the same name. In June 1958 SANTA ROSA was renamed SANTA PAULA The older ship was laid up at Hoboken, NJ until 1961 when she was sold to Greek owners. SANTA ROSA was renamed ATHINAI and began a new career as a cruise ship for Aegean SN Typaldos Lines, Piraeus. A refit increased her accommodation and converted her to carry three classes of passengers. She entered service for her new owners for voyages in the Mediterranean, Black Sea and Adriatic. ATHINAI in her Typaldos Line livery appears briefly in a scene of the port of Piraeus, Greece, in the 1963 film The Bullfighter Advances. In 1968 the Typaldos Lines owners were arrested and the company disbanded after the Greek government investigation of the SS HERAKLION incident found them guilty of manslaughter and negligence. The company's ships were taken over and sold except for two, including SS ATHINAI, who attracted no buyers and were subsequently laid up at Phaleron Bay. SANTA ROSA/ATHINAI never returned to active service. In 1978 she was towed out of layup for use as a film set for Raise the Titanic. After a decade of neglect, and with fittings that did not appear to be out of place on a 1912 built ship, ATHINAI needed very little conversion work for filming the Titanic’s interiors. Her bows were painted to resemble Titanic and she was sprayed with concrete to simulate 68 years on the ocean floor. After the filming she was returned to Phaleron Bay. She remained for another ten years until 1989, when she was towed for scrapping at Aliağa, Turkey in a purge of derelict shipping. She arrived at Aliaga 19 April 1989 and was scrapped by Nigdeliler Hurdacilik. Curacao 2017 121 and 308c sg?, scott?